A comfortable 260 thread count 100-percent cotton cover and white goose down fill make this weightless, all season down comforter a luxurious addition to any bedroom. The baffle box construction provides maximum loft and prevents the down filling from shifting while the fine cotton cover allows the down to breathe. The comforter features 575+ fill power white goose down that's been treated with an anti-microbial process to eliminate bacteria for hypoallergenic bedding that will help you get the best night's sleep so you can wake up refreshed. This all season is perfect in New England! I used to own a down that was much heavier than this all season and it was unbearable in the summer months. Now that I'm writing this review in the summer and I've been able to sleep with the all season down for several months now, I can say that it is my favorite comforter that I own. The goose feathers definitely make it light and airy, and fluffing it every so often makes it very pleasant. The previous goose feather down that I had (manufactured by a different company) left me finding goose feathers flying around the room. I can say that this comforter (so far) is sealed just right and has not created a problem; even when I squeeze it tight when I roll over to lay on my side. All in all, I would definitely recommend this product! Great quality, warmth is great, fits duvet covers perfectly! I looked for a long time to find a comforter that was light weight and warm. This is the perfect balance. I highly recommend this product. I got lucky on Overstock and got one at a discounted price because it was being sold "As is" which meant their were no returns. Since it was about *** lowered from its original asking price and it would be my first ever down comforter (been wanting one forever but couldn't afford it), I thought, "Now or never" and bought it. Whoever returned it hadn't even used it. It was brand new and it's the most wonderfully comfortable comforter I have ever had! I'm buying another so when one is at the cleaners, I can use the other so I never miss a day sleeping within it's cloud-like joy. I'm sleeping better too. Not too hot and not too cold. Just perfection. My little boys also love it so I'll be ordering theirs in twin size so they stop congregating in my bed and return to their own. Not that I mind the cuddles but sometimes, I just want to roll myself up in my down like a burrito and not share. If you don't like it, return it and then I'll buy it at the discounted price. Don't know how anyone can't like it. Gave a few as holiday gifts for family and they LOVE them! To make it even better, get a down pillow top for your bed with 800 thread count Egyptian sheets. Overstock will have it. They don't have sheets to fit my layered mattress and pads. Overstock, you need to work on that. 22" deep Egyptian cotton sheets (800 thread count or higher). Quality comforter, nice to touch top cover. Pretty think and evenly spread filling. Cannot comment how well it lasts yet. Overstock shipping was pretty fast on this order. This duvet makes you feel like you are sleeping in a cloud! It is so light, but keeps you warm and cozy. And changing your bedroom color theme is now a breeze! 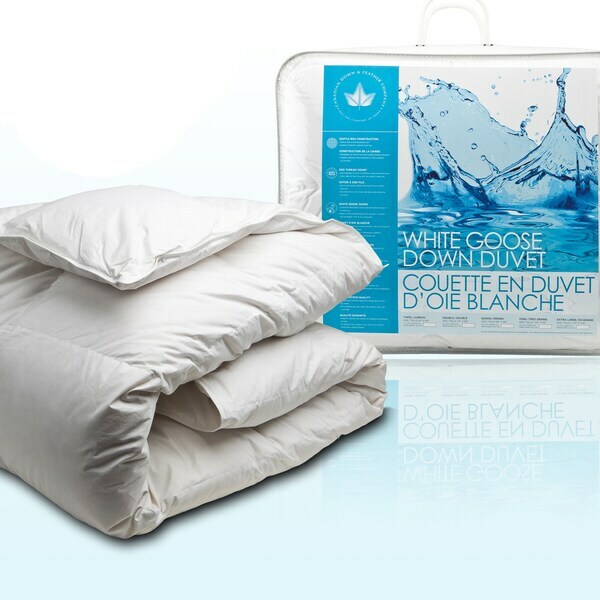 perfect weight quality down n goose duvet.. we are buying another for our boat. This blanket is light and not bulky at all yet sufficiently warm and. cozy. Nice quality and lighter weight down comforter. Feels very nice, and wears well. It has handled countless washings. They have been used for a B&B, nice quality and lasting well. "Is duvet cover included? if not do the larger full/queen size covers fit well? Any recommendations on a cover?" "Does this down comforter have ties to fasten to the ends of a duvet cover?" Need a new comforter, saw this and thought I give it a try. because it wasn't oversized, because I hope it is from Canada and not China. Great price on item still listed on manufacturer's website with phenomenal reviews.